The problem lies in the nerves which run from your legs to your spine. They are being squashed by the bones and ligaments (strong bands of tissue that keep the bones together) of your spine. 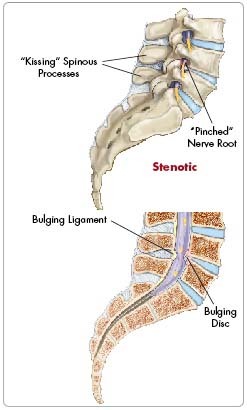 Stenosis means narrowing of the channels in the spine where the nerves run. The pressure on the nerves here makes it feel as if the pain is coming from your legs especially when you walk. You may also have had, and still have, some back pain. Usually only one or two of the bones of the spine (vertebrae) are affected. You will have a general anaesthetic, and will be asleep for the whole operation. A cut is made about three inches (7.2cm) long in your lower back. Part of the vertebrae and the ligament that is squashing your nerves are removed. This takes the pressure off the nerve in your back. The skin wound is then closed up with stitches or clips. You will be in hospital for 7 to 10 days after the operation. In the past, the whole of an arch of bone on the vertebrae, the lamina , was always removed. The operation was therefore called a laminectomy. Nowadays very little of this bone is removed. The operation is now called a nerve root decompression. your leg pain is worse than your back pain. you have had leg pain for several months that is not getting better. your leg pain is interfering with your life. you have had a special scan that shows that your nerves are squashed. If you have all of the above you should have an operation. Stop smoking and get your weight down if you are overweight. (See Healthy Living). If you know that you have problems with your blood pressure, your heart, or your lungs, ask your family doctor to check that these are under control. Check the hospital's advice about taking the Pill or hormone replacement therapy (HRT). Check you have a relative or friend who can come with you to the hospital, take you home, and look after you for the first week after the operation. Bring all your tablets and medicines with you to the hospital. On the ward, you may be checked for past illnesses and may have special tests, to make sure that you are well prepared and that you can have the operation as safely as possible.. Many hospitals now run special preadmission clinics, where you visit for an hour or two, a few weeks or so before the operation for these checks. The wound may be painful. You will be given injections or tablets to control this. Ask for more if the pain is gets worse. A general anaesthetic will make you slow, clumsy and forgetful for about 24 hours. The nurses will help you with everything you need until you are able to do things for yourself. Do not make important decisions during that time. The discomfort of the operation can make it difficult to pass urine and empty the bladder. It is important that your bladder does not seize up completely. If you cannot get the urine flowing properly after six hours, contact the nurses or your doctor. The wound will have a simple adhesive dressing over it. Your stitches or clips will be taken 10 to 12 days after the operation. You will not need a dressing on the wound after that. Wash around the dressing for the first 10 days. You can wash the wound area as soon as the dressing has been removed. Soap and warm tap water are entirely adequate. Salted water is not necessary. You can shower or take a bath as often as you like. You will be given an appointment to visit the orthopaedic outpatient department six weeks or so after your operation. The physiotherapist will advise you and assist you to become mobile after the operation. The nurses will advise about sick notes, certificates etc. You should not drive for six weeks. For three months after your operation you should not drive for longer than half an hour at a time. If your job entails mainly walking with no lifting, you may return to work after four weeks. If you mainly sit at work, you may return after six weeks. If your job involves heavy work or a lot of driving, you may return to lighter duties after 12 weeks. If your job involves very heavy manual work, you may have to change to a lighter job. You may swim six weeks after your operation. You may restart non-contact sports three months after your operation. When you start playing, you will not be able to play for as long as normal and your back will ache at the end of a game. If all goes well, you should be free of your leg pain within a week or two of the operation. Do not be tempted to do too much too soon. Your back will continue to improve for up to one year. A nerve in your back may be bruised during the operation. This temporarily stops it working, making part of your leg numb and slightly weak. It is very rare (1 in a 1000) for a nerve to be permanently damaged. There is a 1 in 10,000 chance of bowel or bladder incontinence after this operation. Wound infection sometimes happens. You will be given antibiotics to try and prevent this. People fear that if the surgeon's knife slips they will be paralysed. This is extremely unusual as the operation is performed away from the lower end of the spinal cord.